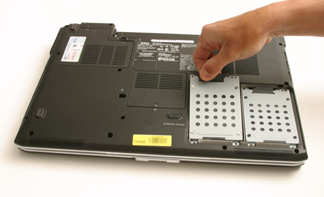 Adding a Second Hard Drive or SSD to a Laptop There are different ways of adding a second hard drive or SSD to a laptop. 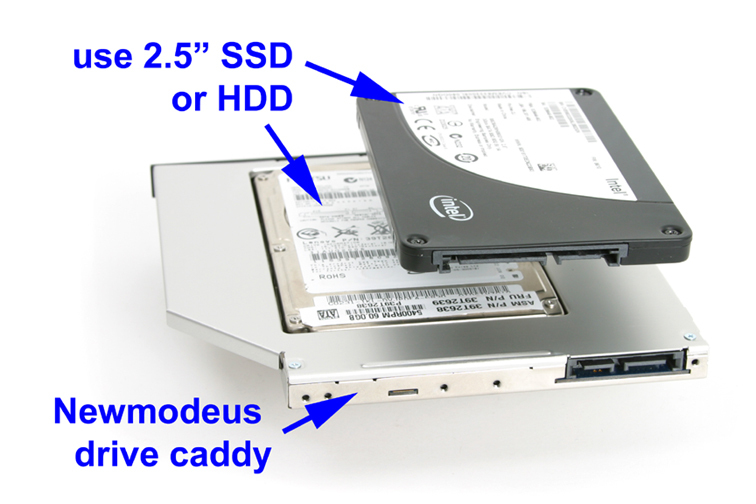 There are laptops that have two hard drive bays (thus making it fairly easy to upgrade), there are laptops with provisions for adding a second hard drive via a special "multi-function" bay, and there are laptops that don't have a built-in provision for adding a second hard drive (but you can still add a second hard drive, as discussed below). Listed below are the various options on adding a second hard drive to a laptop based on what type of laptop you have. Laptops with Two Hard Drive Bays Some laptops such as the DELL Studio 17 and HP Pavilion dv7 or Envy 17 already have two hard drive bays built-in. These laptops typically come from the manufacturer with one hard drive installed. To add a second hard drive, they typically only need a "hard drive caddy" to mount the second hard drive in the second drive bay. Laptops with a "Proprietary" Multi-function Bay Some manufacturer's build-in a special "multi-function" bay into the laptop. DELL calls theirs the "Media Bay or e-Modular Bay", HP/Compaq calls theirs the "MultiBay", IBM calls theirs the "UltraBay". These laptops typically ship from the factory with one hard drive and a CD/DVD Optical drive in the "multi-function" bay. We use the word "multi-function" because these bays could serve multiple purposes, such as adding a second hard drive. We manufacture hard drive caddys that work in these multi-function bays. Removing and replacing devices in these bays are typically easy and plug-and-play. Adding a Second Hard Drive via the Laptop's CD/DVD/ Optical Drive Bay If your laptop does not fall into the two categories mentioned above, then a third alternative is by adding a second drive via the laptops CD/DVD Optical Drive Bay. A majority of laptops that don't have a "proprietary multi-function bay", use a standard-sized CD/DVD optical drive. 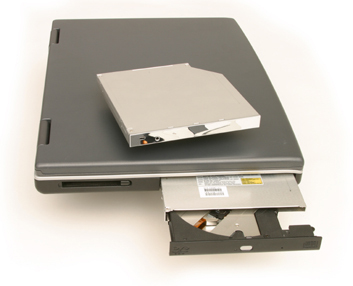 We manufacture hard drive caddys that have the same footprint/dimensions of the standard-sized CD/DVD optical drive. With this caddy (we call it the OBHD, as in Optical Bay Hard Drive caddy), you can add a second hard drive to a laptop.